Buy Natracare Safe to Flush Moist Tissues in the UK from our online shop or directly from our independent Scottish store. Truly clean, safe to flush moist toilet tissue. Cleansing with a gently refreshing formula of organic witch hazel and aloe vera, plastic free and natural. For everyday use. Natracare natural flushable tissues are designed to cleanse and refresh intimate skin to help you feel extra clean. Infused with soothing aloe vera and bacterial witch hazel. Our toilet tissues are certified flushable! Choose truly flushable moist toilet tissues guaranteed to break down safely after flushing, with an organic and natural formula which is kind to the environment. With over 366,000 sewer blockages in the UK every year, it’s costing water companies, and therefore consumers, millions to fix them. But did you know over 80% of blockages are completely avoidable!? We should only be flushing our 3 Ps – paper, pee and poo. Yet many wet wipes contain secret plastics and tissues are falsely marketed as flushable when they are not! Natracare has worked closely with Water UK to develop Industry Specifications for the UK’s first truly flushable tissue. 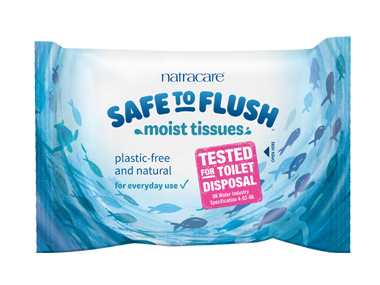 Natracare’s Safe to Flush Moist Tissue is currently only available in the UK. As official Natracare stockist, we sell genuine Cleaning & Laundry directly from our shop in Scotland and online throughout the UK. Where can you buy real Safe to Flush Moist Tissues safely online? If you are wondering where you can buy Natracare Safe to Flush Moist Tissues safely online in the UK, then shop with us. We are an actual health foods shop; with real people selling real foods and products. Our award-winning independent shop is located in Stirling, Scotland since 1976. You can buy our Organic and chlorine free Sanitary products and other genuine Cleaning & Laundry in store or safely place an order with us online or over the phone. Safe to Flush Moist Tissues - Natracare Safe to Flush Moist Tissues in Cleaning & Laundry and Household.